A couple of weeks ago, we addressed the causes and treatments of shin splints. Of course, we overlooked a fairly major consideration when writing that – namely, how to avoid shin splints in the first place! Today, our Caulfield physio will help you understand how you can prevent shin splints from ever happening to begin with. If you participated in any sport during your childhood, chances are you’ve had this piece of advice drilled into you. Whether it was footy, soccer, athletics, or swimming, the advice was always the same: stretch. However, stretching has simply become an outdated technique. If you suffer from muscle tension, we help prescribe a more precise and accurate treatment like dry needling to help reduce tension. We’ll also help you perfect your technique to self-massage with a spiky ball. Compression is a tool that joggers and physios have used for years. By tightening the muscles and veins, compression socks improve blood flow by assisting the movement of deoxygenated blood back to the heart. We bring this up because compression socks are also good for preventing shin splints! While they won’t prevent shin splints on their own, when combined with proper stretching and cushioning, they reduce the impacts placed on your legs during runs. Every step comes with a certain degree of force, trauma and vibration. Shin sleeves provide support and stability, which can make all the difference when avoiding shin splints. Did you know: according to the ABS, only about half of us get the required amount of recommended daily exercise. It’s not a very comforting number. A lack of physical activity has been closely linked to overall physical wellbeing, and with our increasingly sedentary lifestyles… well, let’s just say the outlook doesn’t look good! That’s exactly why many of us are making a habit of hitting the gym more often or squeezing more exercise and movement into our weekly routines. 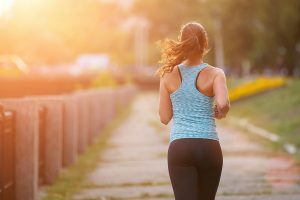 One of the most popular exercises is jogging – it is free, after all – however, many of us make the mistake of going for broke right off the bat. Shin splints are already endemic in runners. Combine that with years of inactivity and legs that aren’t used to physical activity, and you have a recipe for shin splints! If you want to avoid them (and haven’t been active for a while), we recommend starting small. Shin splints are often caused by overuse, so start with less ambitious power walks, and gradually increase your mileage incrementally. Running sends shockwaves up your foot, potentially irritating the muscles and fascia (the tissue that connects muscle to bone). It also puts strain on your shin bone, muscles and tendons, oftentimes leading to shin splints – naturally, you’ll want to minimise this potentially damaging force as much as possible! On thing you can do to minimise the pressure you put on your legs is to run on softer surfaces. Softer surfaces provide a cushion, absorbing a lot of the force your foot hits the ground with and reducing the pressure on your legs. Consider mixing up your routine by going down to your local footy pitch for a jog. And while we’re at it, avoid running downhills as well! Another thing you can do is reconsider your footwear. Running shoes lose their cushion and support with wear-and-tear, exposing your legs to more shock with each step. Don’t wait for the soles to literally fall off before buying a new pair of runners – if you jog every night, start reevaluating your footwear after 6 months. Some people are heel-strikers, hitting the ground – hard – with their heel. Others are “mid-foot” people. Neither is inherently better than the other when it comes to running. When it comes to avoiding injury however, the latter is clearly superior! Like we mentioned above, excessive force can cause shin splints by damaging the muscles, fascia and bones in your lower legs. And oftentimes, the amount of force you expose your legs to directly correlates to your running technique! Another common running technique that can potentially cause shin splints (and other injuries) is pushing off using your toes. This requires much more effort on your calves and shins, which can overwork your legs and lead to injury. If you need help fixing up your technique, talk to your Caulfield physio. As your expert in all things physio, we analyse your technique for errors and create routines that fix any deeply-ingrained habits. If you’ve already taken the plunge into exercise and are suffering from shin pain, book an appointment with our Caulfield physio. At Physio AUS, we specialise in helping our clients live pain-free with a complete control over their bodies. Our unique AUS System focuses on helping you achieve your desired results, creating treatment plans that set out exactly what you need to do, how long we’ll need to continue, and what to expect. We’ve also developed an impressive library and dedicated YouTube channel filled with helpful, hands-on videos to help you live your life free from pain! View our videos here and make sure to subscribe to our YouTube channel here. Physio AUS is unique in that we can also deliver consultations online (in addition to our Caulfield physio clinic) so you can get treatment from the comfort of your very own home! Book your online physio consultation today.